California Reptile/Amphibian Rescue View other Reptiles for adoption. 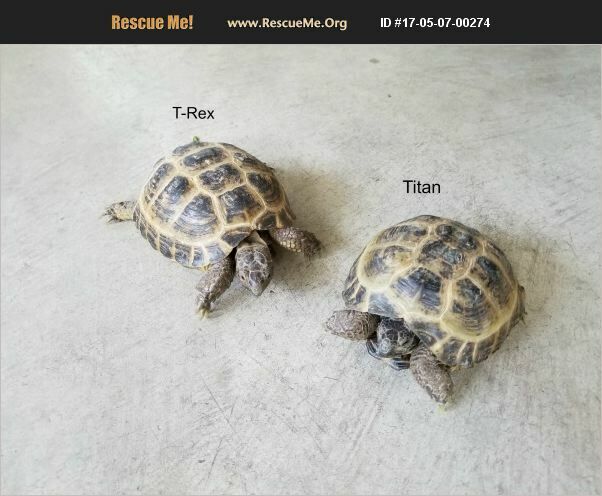 These are two male Russian Tortoises (T-Rex and Titan) that were in my daughter's class room. We took them home on spring break and the teacher asked that we find them a more suitable home. Adoption will need to be done with an inspection of their new habitat. They are in a 40gal. terrarium now and their new home must be at least 50 square feet of open space with partial shade and a covered home. They are very mobile when we let them free in our sun room for the day and T-Rex will allow you to rub his head and neck. I think he likes the attention. They also have really good appetites .Look forward to getting them in a nice and spacious environment.